One of the things I love about the internet, apart from all that wonderful knowledge, potential for creativity, opportunities for learning while having fun, chances to build a network of like-minded people (okay okay, I'll stop!) ... is the happy accidents that put you in touch with projects you love. Isn't serendipity such fun! Yesterday I discovered a page on the internet that made me laugh and want to join in. A guy named Ola Helland has declared to his friend Jorgen that he can get one million giraffes sent to him before January 1, 2011. Right now, there are 237 days left and he has 799 678 giraffes already. How many more does he need? Well, voilà- a great opportunity to see if your kids can work out what the algorism is to find that answer, to see if they can subtract from one million, to discuss the purpose or point of the project, and then to join in and contribute! Giraffes must not be computer-generated, but the site explains clearly what you can do. Kids could tell friends, write to pen friends, classes could enlist the help of other classes, giraffe videos could be studied to hone observation skills, giraffe research done, possible media for the picture discussed - I can imagine such a great time being had by all. 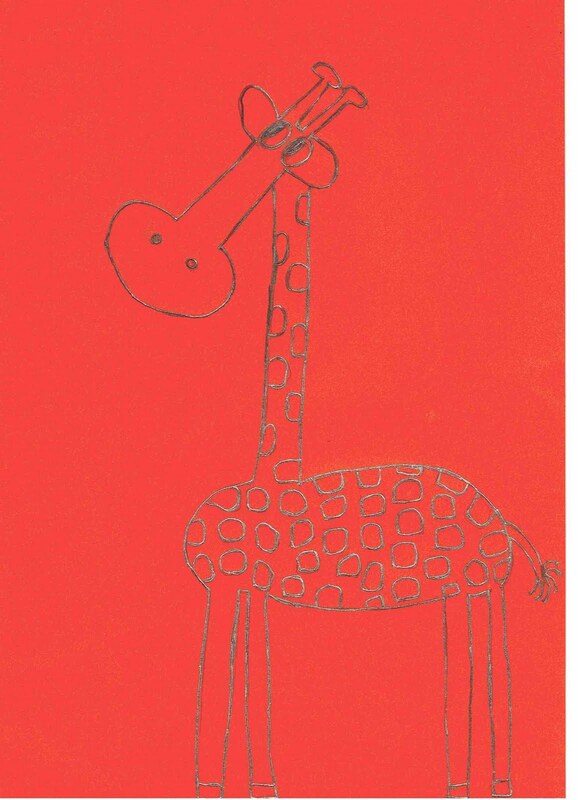 Be inspired by a giraffe of the day on Ola's blog, or check out the gallery of contributions on the home page by scrolling through. 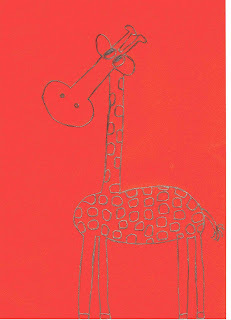 And to start the ball rolling, I'm sharing the giraffe I drew today. As an art critic, I would have to say... it's very um... orange. If you're inspired, I hope you and your kids will join in too. Let's see if we can celebrate the power of the internet, do something fun, creative and quirky - and help Ola reach a million. Why giraffes? As Ola explains: How can you not love an animal that has his feet on the ground and his head among the stars? HAHAHAHAHAHAHAHA! Love it! Will commission some of my artists to add to the collection. That is so much better than anything I could create. May give it go though. Sorry Ian, I don't believe you. I will need to see your giraffe before I concede inferiority. You blog about it and we'll have a giraffe off.